Do they want to roundup, remove and kill wild horses & burros to make room for energy corridors? WASHINGTON – The Bureau of Land Management (BLM), Department of Energy (DOE) and U.S. Forest Service (USFS) released in May a study that provides a foundation for upcoming regional reviews of energy corridors on western public lands to assess the need for revisions and provide greater public input regarding areas that may be well suited for transmission siting. The regional reviews will begin with priority corridors in southern California, southern Nevada and western Arizona, and provide more opportunities for collaboration with the public and Federal, Tribal, state and local governmental stakeholders. The study examines whether the energy corridors established under Section 368(a) of the Energy Policy Act of 2005 are achieving their purpose to promote environmentally responsible corridor-siting decisions and to reduce the proliferation of dispersed rights-of-way crossing Federal lands. With the aim of encouraging more efficient and effective use of the corridors, the study establishes baseline data and presents opportunities and challenges for further consideration during the periodic regional reviews that BLM and USFS will conduct. The corridors address a national concern by fostering long-term, systematic planning for energy transport development in the West; providing industry with a coordinated and consistent interagency permitting process; and establishing practicable measures to avoid or minimize environmental harm from future development within the corridors. Section 368(a) directed several federal agencies to designate corridors on federal lands in the 11 contiguous western states to provide linear pathways for siting oil, gas and hydrogen pipelines and high voltage transmission and distribution facilities. The contiguous states are Arizona, California, Colorado, Idaho, Montana, Nevada, New Mexico, Oregon, Utah, Washington, and Wyoming. As required by a 2012 Settlement Agreement that resolved litigation about the corridors identified, the BLM, USFS and DOE established an interagency Memorandum of Understanding (MOU) to explain how the agencies will review the Section 368 (a) corridors on a regional basis. The MOU, signed in June 2013, describes the interagency process for conducting the reviews, the types of information and data to be considered, and the process for incorporating resulting recommendations in BLM and USFS land use plans. The full-text of the corridor study is available online at: http://corridoreis.anl.gov. The BLM manages more than 245 million acres of public land, the most of any Federal agency. This land, known as the National System of Public Lands, is primarily located in 12 Western states, including Alaska. The BLM also administers 700 million acres of sub-surface mineral estate throughout the nation. The BLM’s mission is to sustain the health, diversity, and productivity of AmericaÂ’s public lands for the use and enjoyment of present and future generations. In Fiscal Year 2015, the BLM generated $4.1 billion in receipts from activities occurring on public lands. Palomino Valley Center near Reno, Nevada and all other holding facilities must provide access to shelter from the elements. Denying shelter is abusive. “Now it’s time for BLM facilities in Nevada, Colorado, Utah and other states to stop making excuses and provide shelter for captive wild horses in their care,” states Anne Novak, Executive Director of Protect Mustangs. “Contact your elected officials and ask them to intervene to bring shelter to America’s indigenous horses trapped in pens,” urges Tami Hottes, Protect Mustangs’ Outreach Coordinator for the Midwest and South, who was pleased to discover shelters at the Nebraska BLM holding facility. 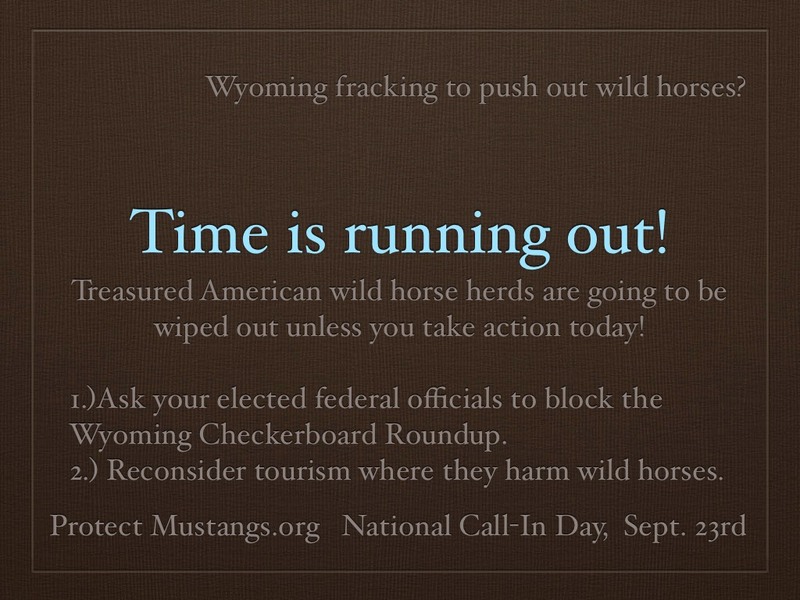 Share and TAKE ACTION today for Wyoming’s wild horses! National CALL-IN day is Monday, September 23rd! CALL and Ask your Congressional Representative and 2 Senators to STOP the WIPE OUT! Wyoming’s wild horses must not end up in the SLAUGHTER Pipeline!!! They deserve their land and their freedom! Send your comments in to BLM! 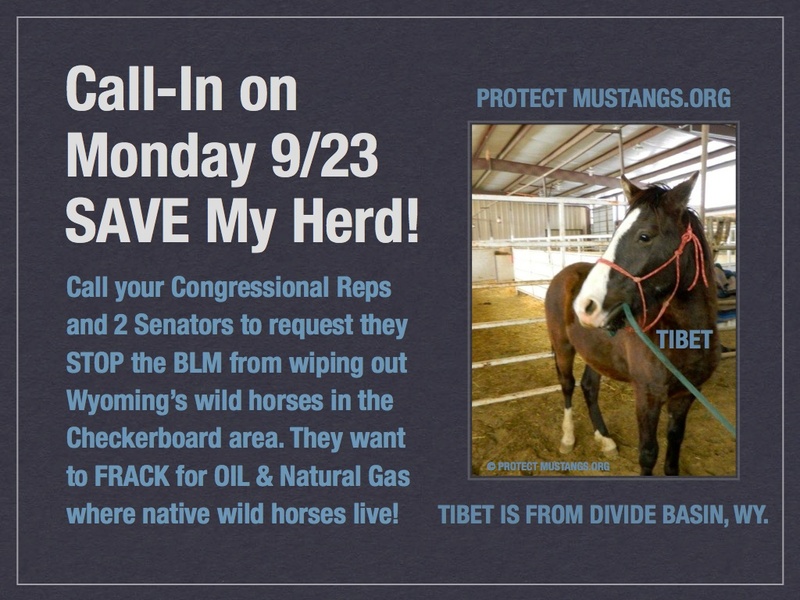 Info here: http://protectmustangs.org/?p=5084 Canned comments don’t count! Please write your own and remember there is “No Evidence” of overpopulation according to the National Academy of Sciences. Request a Moratorium on Roundups for Population Studies! The Wyoming travesty was mentioned in GASLAND 2. 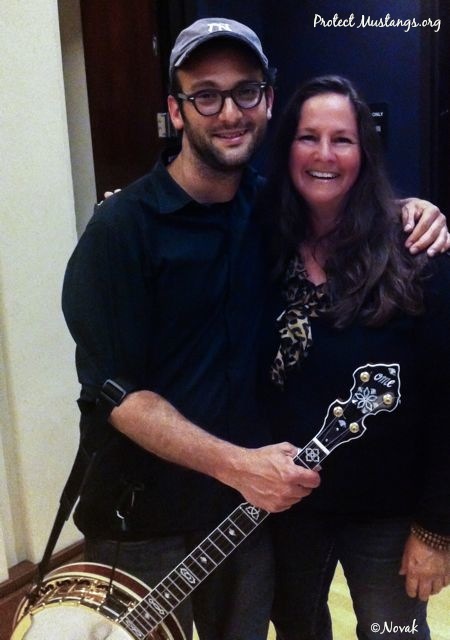 See the movie (http://www.gaslandthemovie.com) and share it with your friends. 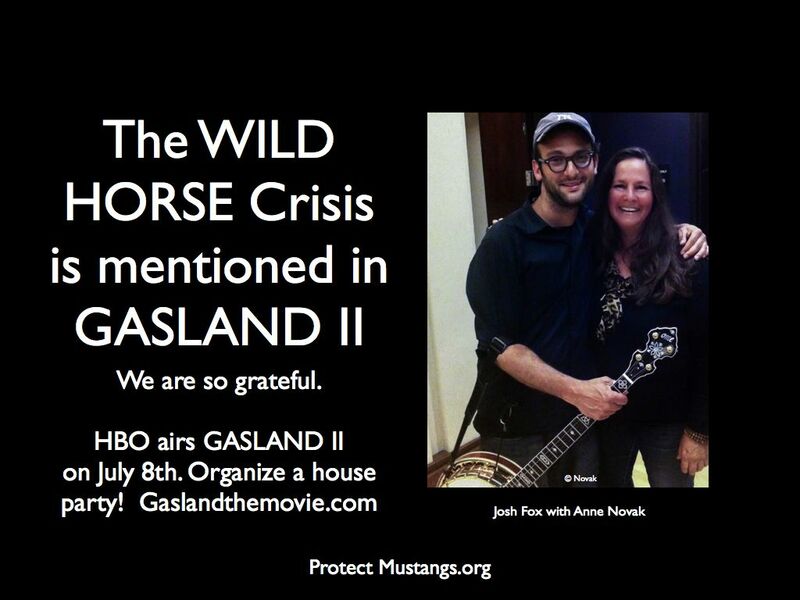 SAVE Wyoming’s wild horses! They belong to all Americans because they are under federal control. WASHINGTON (February 14, 2013)–Daryl Hannah, who was arrested yesterday at the Keystone XL Pipeline Protest, and Oscar-winner Michael Blake (Dances with Wolves) speak out to protect America’s indigenous horses, historic burros and public land. The celebrities join Protect Mustangs’ Make LOVE Not Roundups™ native wild horse awareness campaign. Mustangs and burros are being cleared off public land to minimize environmental restrictions for toxic drilling. Recently, beef in the EU has been contaminated with toxic horse meat. Horse lovers and health enthusiasts are concerned the same scandal will happen in the U.S.A. if horse slaughter isn’t stopped. Native wild horses are at-risk of going to slaughter for human consumption abroad now that Oklahoma’s elected officials appear to be supporting horse slaughter for human consumption in foreign countries. Protect Mustangs wants the cruel roundups to stop now. They are asking for all wild horses and burros “stockpiled” in government holding to be returned to the protected zones of public land specified in the Free Roaming Wild Horse and Burro Act of 1971, called Herd Management Areas. WASHINGTON (October 6, 2012)–Protect Mustangs announced on Facebook Friday their call for nationwide protests to stop the roundups and stop the Bureau of Land Management (BLM) from selling federally protected indigenous wild horses to kill buyers. Last week ProPublica exposed the BLM selling at least 1,700 federally protected wild horses to known pro-slaughter buyer, Tom Davis, and the public is furious. The BLM is charged with managing and protecting wild horses–not selling them for $10 a head to a pro-slaughter middle man to reduce the numbers in holding due to years of fiscally irresponsible roundups. This week the Antelope roundup, in northeastern Nevada, started under the pretense of saving the wild horses from a drought stricken area. In watching videos from the roundup it should be pointed out that these wild horses were actually in excellent shape and there is no sign they have been suffering from lack of water or forage this summer. They are efficient browsers. Even though the BLM announced last spring they would bait trap, they are not keeping their word to the American public. 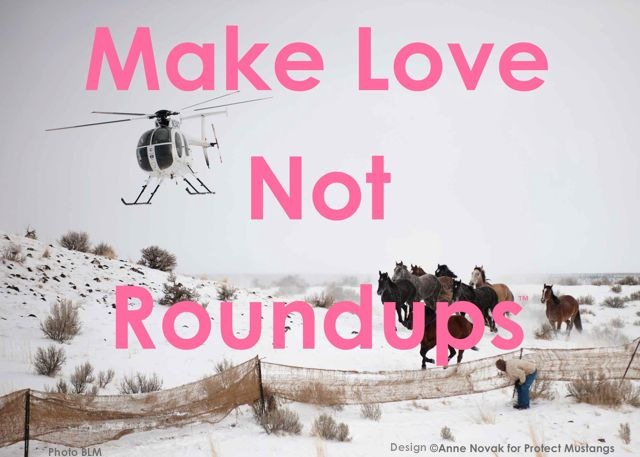 The BLM continues with cruel helicopter roundups. The contractor has been criticized in the past for deadly incidents that could have been prevented. Despite objections from advocates and members of the public, the BLM continues to hire the contractor. At the Antelope roundup advocates from The American Wild Horse Preservation Campaign (AWHPC) recorded videos showing healthy horses stampeded into traps, foals terrorized by choppers and a terrified stallion jumping out of the capture corral breaking his leg and running away. He was then euthanized by the BLM. During the roundup wild horses were traumatized with whips and a wild mare broke her neck and died in transport. If these historic wild horses had not been rounded up surely they would be alive with their families roaming in the West. Outraged members of the public are calling BLM officials requesting the roundups stop. Officials downplay the cruelty and trauma, claiming these were rare incidents and touting that roundups, also known as “gathers”, only have a 1% death rate. 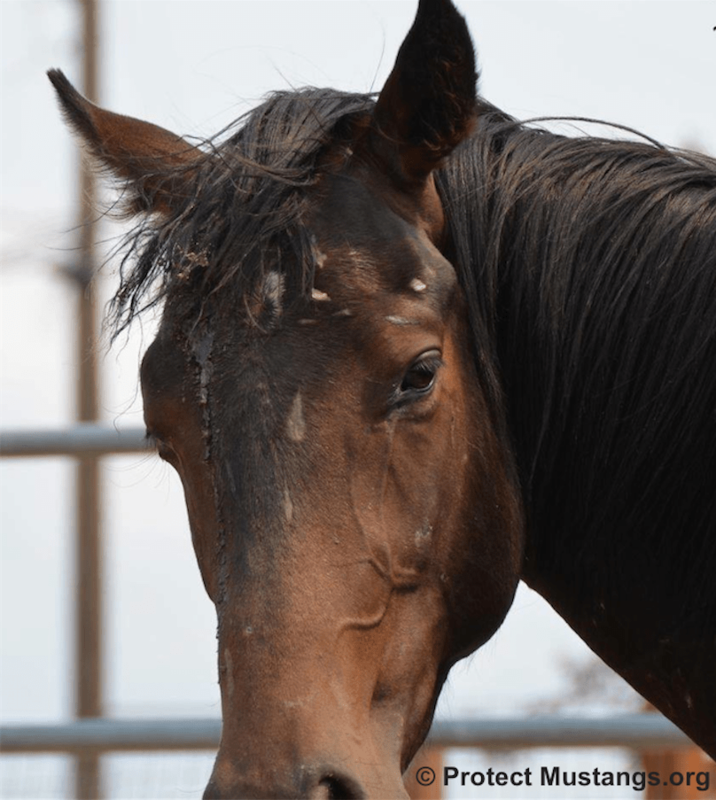 The federal agency, funded by Congress to manage wild horses and burros, attributes the gross majority of roundup deaths to pre-existing conditions when they are obviously roundup related. If the horses weren’t rounded up they surely would not have died at that time. The BLM often kills indigenous wild horses for being “old” and claims it was a pre-existing condition. They also kill baby horses claiming they have leg deformities. The foals can’t tolerate being stampeded for many miles on their undeveloped baby feet and legs and suffer severe injuries and are euthanized. BLM resists taking responsibility for their heinous actions. At roundups since 2009, advocates as well as members of the press and public have been pushed back from the trap site and the holding corrals. It appears the BLM wants to hide the cruel roundups and injured animals from public view. In 2004, a stealth rider known as the Burns amendment was attached to the Congressional Appropriations Bill to allow unlimited sales of captive wild horses over the age of ten or those who have been presented at adoption venues (live or Internet) three times–even pregnant mares and one-year-olds called yearlings. The recent ProPublica article, written by Dave Phillips, highlights a corrupt program and interviews a pro-slaughter middle man. According to ProPublica, ‘Tom Davis buys 100s of mustangs at a time, sight unseen, for $10 a head. BLM has sold him more than 1,700 wild horses and burros since 2009. “Hell, some of the finest meat you will ever eat is a fat yearling colt,” he says. In 1997 Associated Press investigative journalist, Martha Mendoza, uncovered BLM’s internal corruption wherein adopted wild horses were quickly being sold to slaughter even by BLM employees who adopted them. ‘A multimillion-dollar federal program created to save the lives of wild horses instead is channeling them by the thousands to slaughterhouses where they are chopped into cuts of meat. Mendoza’s Freedom of Information Act (FOIA) research and the story she exposed, forced the adoption program to change their protocol and only give title to the mustangs after one year to prevent the wild horses from being sold into the slaughter pipeline. Today the BLM sends America’s living treasures to slaughter by selling them to the middle men who sell them to slaughter. Protect Mustangs asks Congress for a freeze on roundups, a freeze on sales and a full investigation into the ‘sale authority program’ since 2005. The roundups ramped up in 2009 with the stimulus package push for the New Energy Frontier on public land and a new mandate to wipe out the wild herds of the West known as The Salazar Plan. Despite nationwide protests in 2009-10 against the Secretary of the Interior’s plan, the majority of wild horses and burros were ripped from their family bands, taken off their land and the stallions were sterilized. President Obama ignored public outcry and Congress eventually fell for the BLM pleas for funding to ‘help the wild horses’. In 2010, 54 members of Congress joined Congressman Raul Grijalva requesting a moratorium on roundups and a National Academy of Science (NAS) investigation into the broken program. Somehow the BLM has taken charge of the NAS investigation now called a “study” and is feeding the NAS the information instead of the Academy conducting independent research. Today more than 52,000 wild horses and burros are living in captivity–mostly in the Midwest as specified in the Salazar Plan. Last year the controversial Wild Horse and Burro Program cost the American taxpayer 78 million dollars. Next year the cost will increase. Protect Mustangs requests that Congress work with advocates to find a way to return wild horses to their wild lands in the West–to create biodiversity on the range–a win-win for wild horses, livestock, landowners, tourism and energy development on the New Energy Frontier. Their presence also helps greatly to reduce wildfires. The BLM’s reproduction rates don’t account much for mortality within the herd. Often foals don’t live to be two years old but the BLM spin on population has them multiplying like rabbits. Studies show predators such as mountain lions and coyotes reduce the wild horse foal population. Last summer several young foals were killed by coyotes at a BLM holding facility near Sparks, Nevada. Even so, the BLM hides the truth about predators reducing the population and continues to repeat they have no natural predators despite the fact they do.